Think about how much time you spend in the shower, brushing your teeth and hair, or putting on makeup. Bathroom remodeling might not only add value to your home, it could help you begin and end your day in a better mood. When discussing ideas with a professional remodeler, consider these three trends you might want to try as well as three ideas you might want to skip. While white paint and tile can make a space feel more open and clean, natural wood can give your bathroom a warm and contemporary feel. Try adding wood as panels or accents paired with a neutral like light gray to create a serene atmosphere. Wood is even a practical option for your bathroom floor. All it needs is a few more coats of varnish to keep it looking good through the years. Future upkeep is simple, too: just get it refinished and resealed when needed. Take advantage of the new colors and designs of tiles when remodeling your bathroom. Try hexagonal tiles if you want something unique. Rectangles can be arranged in a herringbone or basket weave patterns to add interest to a shower or backsplash. Mix colors and shades to create a dimensional look or show off their design by mixing a light tile and a darker grout. Think outside the box for storage that’s tailored to your life. You might want special drawers for electric shavers or hair dryers, a medicine cabinet where you can actually fit all your things or maybe even a charging station for your phone. Setting up your bathroom so it works with you might help you get out the door a bit sooner. Working with an expert with make your bathroom remodeling go smoothly. 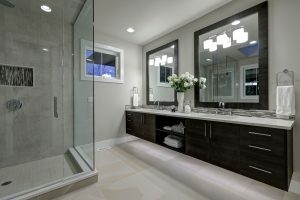 Take time to talk about what you want and he or she can help you get the bathroom of your dreams.